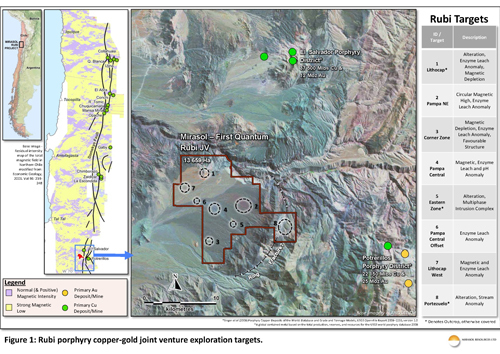 Mirasol is pleased to provide an exploration update on its Rubi porphyry copper – gold JV with First Quantum Minerals (First Quantum) in the El Salvador – Potrerillos copper mining districts of northern Chile. First Quantum has been conducting an aggressive surface exploration program under the terms of a binding Letter Agreement, spending approximately US$680,000 in the September 2013 to June 2014 period. With the signing of the Definitive Option and Joint Venture Agreement on August 14, 2014 (see news release August 27, 2014), First Quantum can now begin preparations to scout drill-test priority targets at Rubi. An archeological and environmental management plan, and drill proposal, was submitted to the Chilean authorities in late July 2014. This may take up to 10 weeks to process. Processing of 2,460 line-km of a detailed helicopter magnetics survey of the project with leading-edge 3D modelling software to highlight structure and potential exploration target areas. An extensive property-wide soil survey using both conventional soil samples in areas of locally derived soils and enzyme partial leach* technique in the gravel-covered areas. The partial leach technique was applied in the gravel areas, as under some circumstances this approach can detect mineralization through transported overburden. Soil buffer capacity** (acidity) was also measured as an additional technique to potentially detect buried areas of oxidizing sulphide mineralization. A gravity survey covering much of the property was completed and combined with field observations to model the depth of gravel cover over the majority of the property. These results suggest that much of the project is covered by zero to less than 100 metres of gravel. This is considered relatively thin cover for modern Chilean porphyry exploration. The gravity model will be used to help prioritize targets in the shallower cover areas for drill testing. Outcropping areas of alteration were surveyed with grid-based hand-held infrared spectrometer*** measurements. This information is used to identify alteration mineral species and changes in chemical composition and degree of crystallinity of these minerals. A combination of these factors can be used to vector towards more prospective parts of a mineralized system. Systematic geological mapping and rock chip sampling was also completed over the main prospects where outcropping alteration is evident. A number of prospective new target areas identified within the large gravel-covered plain at the centre of the project. An electrical geophysical survey has been initiated over some target areas at Rubi. This survey combines high sensitivity Induced Polarization (IP) and Magneto Telluric (MT) geophysical techniques. Combined, these techniques can be used to detect buried sulphide or silica accumulations through gravel cover and at significant depth that can indicate potential areas of mineralization. This geophysical data will be used as a final layer of information to filter and prioritize areas for drill testing. Mirasol’s management are pleased with the exploration approach and outcomes to-date from the First Quantum program at Rubi. This work has increased the number of potential targets and has built a strong knowledge-base to leverage final drill target selection. The Rubi project is located adjacent to two large porphyry copper – gold mining districts in what Mirasol believes is an underexplored section of one of the world’s more productive porphyry copper belts. Mirasol will continue to report on progress toward drill testing of the Rubi Project as new information is received. First Quantum Minerals operates the Rubi Joint Venture and generated the geological, geophysical and geochemical information reported to Mirasol Resources. First Quantum uses industry accepted procedures for the collection and analysis of this information including a formal quality assurance and quality control (QA/QC) program and ISO 9001:2000-accredited assay laboratories for geochemical analysis. Mirasol has performed an independent analysis of the information and reports provided by First Quantum. Stephen Nano has reviewed the data and prepared this news release, and is a qualified person as defined by National Instrument 43-101. * Enzyme partial leach soil sampling: Actlabs Enzyme Leach SM used at the Rubi Project is a partial leach technique that selectively extracts elements from amorphous manganese oxide coatings on soil materials. Under the right circumstances, these elements potentially derived from underlying concealed mineralization are transported through the soil profile and concentrate in the oxide coatings. The Enzyme Leach soil technique has been successfully used to detect soil or gravel-covered mineralization by other companies in Chile and at other locations around the world. **Soil buffer capacity: Oxidizing sulphide mineralization generates hydrogen ions that are acid by nature. These ions migrate vertically above an oxidizing sulphide body and come in contact with carbonates that naturally occur in the near-surface soil, dissolving the carbonate and lowering the buffering capacity of the soil. Systematic measuring the buffering capacity in the soil can map areas of low buffering capacity that may indicate the presence of an oxidizing sulphide body at depth. ***Hand-held spectrometer: A field portable device (PIMA, ASD, PSM devices) that measures the absorption of light in specific wavelengths of the infrared spectrum to identify certain mineral species and changes in their chemical composition or crystal structure. Some mineral species are known to occur in altered rock associated with or in the periphery to mineral deposits. In known metalliferous deposits some of these minerals have been demonstrated to also show systematic changes in their mineral chemistry or increasingly ordered crystal structure as a vector towards mineralization. By analogy this information can be used as an exploration vector in alteration system to help focus exploration into areas with better potential for mineral discovery.